Off-roading (OR) is a time-honored tradition in Texas, so much so that the Texas Parks and Wildlife Department has even created a Texas Off-Highway Vehicle Program (OHV). The hopeful purpose of the OHV is to provide education and resources to encourage safe and responsible off-roading and decrease the number of OR injuries. Currently, Texas is ranked number two out of all 50 states—second only to California—for having the most off-road and ATV-related deaths in the nation. Driver error. Any type of vehicle, whether it be a car, motorcycle, bike, or three-wheeler can be difficult to maneuver on even ground, let alone hilly, rocky, and wet ground. As a result, many drivers lose control of their vehicles or “wipe-out” as a result of terrain ignorance or inability to control their vehicles. Alcohol or impaired driving. Many ATV drivers take the opportunity of being out in the wilderness as an invitation to get smashed. The lack of traffic and road rules decreases limitations and further encourages a bit of drinking since it won’t matter if you can’t drive in a straight line. Unfortunately, whether around others or not, drinking and driving can still seriously injure the driver and cause horrendous accidents. Poor weather conditions. Rain, snow, and excessive wind can wreak havoc on the landscape and increase risks of rollovers, slides, and loss of control. Vehicle defects. 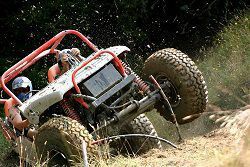 Whether you’ve been off-roading for years and know your vehicle inside and out, or if you’re just a beginner, a defect within your ATV can cause you to lose control quickly and dangerously. Manufacturing defects can occur at any point during an ATV design, building, or testing without notice. If a defective ATV winds up in your hands, it can have very real consequences for you and your family—just as it did for Fort Bend County Sheriff’s Deputy Harold Barron and his family. In February 2013, Barron was riding his ATV in his back pasture in southeast Houston, without a care in the world, when suddenly the ride took a wild turn for the worst. According to reports, a chain on the ATV caught on a concrete pillar, flipping the vehicle over. When discovered by first responders, Barron’s lifeless body was found trapped underneath the vehicle. Although it is unclear whether the chain was a pursuable defect of the ATV, you can see how even the slightest imperfection of a nut, bolt, or chain can have catastrophic effects. When a company releases a defective product, especially one that is specifically designed to operate in high-risk areas, they can very likely be liable for their mistakes in a court of law. When you purchase an off-road vehicle or ATV you should be able to feel confident that your vehicle is in perfect condition. It doesn’t matter if you’re the type of off-roader who likes to take risks, or the type who values a steady ride, the only factor you should have to worry about is how you control your machine—not how the machine may affect your ability to drive it. If you’ve recently been injured in an ATV accident where you suspect a manufacturing defect was involved, contact us at 800-232-3711. A simple call can get you on the right track to pursue an injury claim. Pick up the phone and schedule your free, no-obligation consultation today to get the guidance, support, and legal backing your injuries require.